History to date of my mission to date to conclusively prove that the RMS Titanic was lost as the result of grounding on an submerged ice shelf rather than having her hull breached by starboard side contact with an iceberg on April 14, 1912. In July 2001 I made my first dive to the Titanic. This adventure was a realization of a dream that I held for more than 50 years. My fascination with the Titanic legacy began when I was eight years old. It was then that my English grandmother gave me a book that she had originally purchased in late 1912. This book was entitled The Sinking Of The Titanic And Other Great Sea Disasters. It was written in 1912 by a Marshal Logan. I spent the ensuing years trying to unravel the mysteries of the Titanic sinking. There have been many theories and plausible explanations made by a very educated group of people concerning what happened the night of April 14/15th during that fateful three hours from the time that the Titanic struck the iceberg until the time it sank. The commonly held theory is that the Titanic struck a glancing blow to the starboard side of its hull as it passed by the iceberg. The obvious contradictions to this theory have held me many years to the belief that another explanation prevailed. When my grandmother presented me with the book, I immediately consumed it. Also, even though I was not a boater at that time, questions developed in my mind as to the true nature of the disaster. Even as a neophyte, one has to ask himself, how can a ship traveling in at 22 knots sideswipe at an iceberg and have the majority of its occupants not realize that collision had occurred? As I grew older, my basic understanding of physics led me to realize that for every action there’s a equal and opposite reaction. If the Titanic had contacted the iceberg in the manner that currently theories dictate, the resulting impressions of its occupants would have been much different than those related in survivor accounts. These recollections and known facts along with the knowledge many virtually slept through the event has to bring into question the impressions that have gilded the textbooks. The fact that there is no record of anyone losing their footing, china and glasses crashing to the floor, or a serious feeling that any major event occurred, provide ample opportunity for the assumption that the Titanic’s rendezvous with the iceberg was decidedly different than those portrayed in current textbooks. I held my beliefs in abeyance until after I had concluded my initial dive to Titanic in 2001. After viewing the Titanic wreck site first hand and again reviewing all of the published photographs and observer accounts of others who had had the same opportunity as I, it became glaringly obvious that nothing could be conclusively speculated, much less proven from the wreckage contained within the known debris field. The forward hull section, although being the best preserved and being the portion of the vessel which everyone agrees contains the area which made contact with the iceberg also hit the ocean bottom traveling somewhere close to 30 knots in its fateful plunge, burying the draft portion of its hull some sixty feet into the hard, glacier rock strewn mud. It is almost laughable for anyone to creditably claim that evidence of starboard side hull plate separation discovered through ultrasound soundings made of the buried hull conclusively proves the faulty theory of sideswipe. The hard fact is that the true location of the Titanic’s hull contact with the iceberg WILL NEVER BE determined by any currently known scientific examination of the forward section of its hull for the simple reason that it is impossible to separate the below water line damage that might have occurred from contact with an iceberg from that which surely occurred when it impacted the ocean bottom at 30 knots. On that first dive, I concluded that the real evidence lay elsewhere. Shortly after returning from the 2001 expedition, I had the opportunity of procuring a copy of a recently published book written by David G. Brown entitled “The Last Log of the Titanic”. I read this book from cover to cover and also reviewed the White Paper prepared and presented by David Brown and Parks Stephenson to the Society of Naval Architects and Marine Engineers in May, 2001. 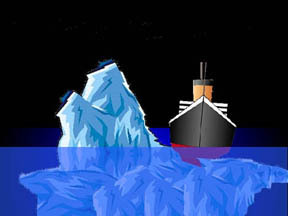 I found myself in general agreement with many of the conclusions reached by Captain Brown and Mr. Stephenson in their research of the subject, particularly with the theory that the Titanic actually was able to “port around ” the above water portion of the iceberg in accordance with First Officer Murdoch’s emergency avoidance plan. Both Captain Brown and myself are in agreement that the fatal damage inflicted on the Titanic’s hull was due to the grounding on an underwater ice shelf rather than a starboard piercing of the forward side of Titanic’s hull. Although his research penetrated far deeper in the records than I had been able to, it still lacked conclusive proof. There is general agreement that Titanic encountered an iceberg at approximately 11:40PM (Ship’s time) on the night of April 14, 1912 at 41.43.25N latitude, 49.56.55 W. First Officer Murdoch, the officer in charge of the Bridge at that time, reportedly gave the order to stop engines and instructed the Quartermaster to bring the helm, “Hard a’starboard” in a vain attempt to port around the berg. It had long been my belief that the ship actually missed colliding with the above water portion of the iceberg and instead grounded, her keel coming in contact with an underwater ice shelf somewhere along the bottom of the bow section of the vessel, the result of which stripped loose sections of exterior bottom plating in its tank bottom, opening it to the sea. Titanic strikes iceberg, tearing plates from its bottom just as Murdock gives second helm order. Ships tremendous weight bearing down on ice shelf, levering the above water portion of the berg toward its starboard side. The resulting brush depositing chunks of ice on the forward well deck. Traveling in excess of 21 knots at the time of impact and having cleared the bow to the left of the above water portion of the berg, Murdoch executed the second half of the “Port Around” maneuver by ordering the helm to Port in an attempt to swing the advancing stern section of the Titanic clear of an impending collision with the visible portion of the iceberg. As the stern began to swing to Port, the ship grounded, effectively accelerating the bow’s shift to starboard. As the ship’s keel rode up on the underwater shelf, a number of things happened in the relatively few seconds of contact. Rivets holding the bottom hull plating in the area of contact were sheared by the movement of those affected plates and large sections of bottom plating in the area of the forward keel of the ship were torn loose and began tumbling to the depths some 2 1/2 miles below. The already established turning momentum of the ship was thus assisted by the fulcrum of contact of the forward portion of its keel and starboard tank bottom as it rode along the transverse slope of the ice shelf. This contact assisted the ship to change its forward course from easterly to almost north as it essentially pivoted on this fulcrum of forward hull contact, aided by the force of its rudder now pushing the stern to port. As the Titanic continued to slowly swing north, it also continued to move forward across the underwater shelf before sliding free. During this process, the tremendous weight of the vessel depressed the ice shelf as it rode over it, effectively levering the above water portion of the berg toward the starboard side of the Titanic’s forward well deck as it passed, brushing off pieces of surface ice in the process which fell harmlessly to the deck. All recorded indications document that the engines were brought to a full stop either before or within moments of contact and NOT reversed as some would have others believe. Survivor accounts contradict any thought of engine reversal as anyone with a shred of marine experience knows the consequence of reversing engines on a ship traveling in excess of 21 knots would have most likely transmitted dire consequence to the mechanical drive train of the vessel. At the very least, if such an action had been taken, it would have literally rattled the teeth out of every passenger and crew, particularly those located in the stern sections of the ship. Neither of those consequences can be supported by any of the testimonies given at either of the two inquiries conducted as a result of this tragedy. After becoming free of the iceberg, the ship continued to coast north as the iceberg with which it had its rendezvous continued to drift south in the prevailing current. There are some accounts that the Titanic may have been restarted and run forward at slow speed for as long as a 10 minute period between the time of impact and midnight…….. before it was realized how badly wounded she was. Under either scenario, the Titanic could have coasted or been driven north for 2-3 nautical miles before finally coming to a stop at approximately 12 midnight. As lifeboats were readied and lowered, it then begin to drift south with the current in the same manner and rate as the iceberg which it had collided some 20 minutes earlier. During the vessel’s northerly coasting and the iceberg’s southerly drift, the distance between it and the iceberg it impacted steadily increased. Once the Titanic coasted to a stop and began to drift with the current, the distance between it and the berg remained relatively constant at approximately 4 to 6 nautical miles. Judging that the Titanic was stopped at 12 midnight when the order was given to prepare the lifeboats for lowering, and broke up and sank almost 2 1/2 hours later at 2:20 AM, the Titanic could have drifted back south to an area within a one nautical mile radius of the geographical location of its initial contact with the iceberg. The location of actual impact has been entirely based on the dead reckoning coordinates given by 4th Officer Joseph Boxhall and these coordinates have often been brought to question the many speculations that have been advanced since that fateful night in 1912. If my theory was correct, the conclusive evidence was to be found at a place outside the established perimeter of the known wreck site and debris field… most likely at a point on the ocean floor directly below the actual geographic location of the collision that occurred at 11:40 PM, April 14, 1912. The proof that I was looking for would be in the form of bottom hull plates or sections of the starboard bilge keel of the Titanic lying in an area free of break up debris. Currently, the bow and stern sections lie on the bottom some 2000 feet apart, with stern surrounded by a massive field of debris as a result of the surface break up of the vessel. Hull plating lying on the bottom outside the perimeter of the known break up debris field can be safely assumed to be the result of something other than the break up,…namely, the grounding. These isolated pieces of bottom plating would not only offer proof of the actual cause of the sinking, they would also mark the actual geographical location of the grounding. Although expert testimony after the disaster estimated that the aggregate opening Titanic’s hull created by its contact with the iceberg approximated 12 square feet, I believe that the plates torn from the hull as the ship grated across the submerged ice shelf opened an area in the outer hull that may have been considerably larger than that. Research done by David Brown also appears to substantiate this contention. The 12 square foot area was the result of a mathematical calculation considering the amount of water entering necessary to overcome the vessel’s buoyancy versus the time that the Titanic remained afloat after striking the iceberg. One has to remember that the Titanic employed a double bottom in its construction and there is no evidence that the accident caused a breach in the tank top of this structure. The space existing between the bottom side of the ship and the tank top (which was in essence the lowest deck of the vessel ) was known as the “tank.” However, there was interesting testimony given during the U.S. Inquiry into the disaster. Samuel Hemming, a seaman from Southampton, England testified to hearing a loud hissing coming from the area of the forecastle head shortly after the accident. Going down all the way to the tank top and finding everything dry, he determined that the hissing was coming from a vent pipe on the top of the tank top, indicating that water coming into the ship from the hole/s in the bottom of the ship (i.e., the tank bottom). Although the aggregate opening in the ship’s bottom likely exceeded 12 square feet, the aggregate opening in the tank top was likely close to that area. The condition that existed was much like inverting an open container in a pail of water. The water rises in the open end of the container to the level at which the trapped air is compressed to equal the force of the entering water. If one then makes a small opening in the top of the closed container thus allowing air to escape, the water rises in the container at a proportional rate to the area of the punched hole, NOT in proportion to the area of the submerged open end of the inverted container. 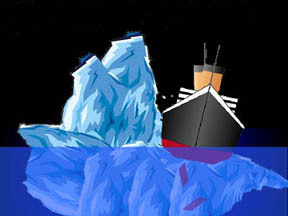 Such was the case with the Titanic………… even though it had a number of hull plates missing from its bottom after the grounding, the initial sizes of openings existing in the tank top of its double hull which allowed entrapped air to escape actually governed the rate of its sinking and not the opening created in its outer hull. Other openings in the referenced tank top were sealed with heavy canvas reinforced with steel battens. Testimony indicated that the canvas cover on the forward hatch ballooned up after the accident, being held in place only by the strength of the battens. It doesn’t take much imagination to know the effect on the ingress of water once those battens failed, which I believe may have happened during the latter phases of the sinking. In July, 2002 I participated in a Expedition to explore the Rainbow Vents which occur at the Mid-Atlantic rift southeast of the Azores which, although very interesting, served to fortify my desire to again visit the Titanic. In the ensuing period, I gathered whatever further information and opinions of the Titanic disaster and started to map a plan for my return. Part of my research followed the salvage operations conducted from the time of its discovery in 1985 by Dr. Robert Ballard to the present. The current Salvor-In-Possession, the RMS Titanic group was mired down in legal and financial problems and in the course of my research of that situation, a friend and Explorer Club member, Don Walsh directed me to contact David Concannon, also a member of the Explorers Club. During the course of the many conversations we had, David revealed to me that in 2000, while making a dive to the Titanic wreck site, he and his pilot, Anatoly Sagalevitch, had ventured to an area far south of the stern section in search of a basket of salvaged relics lost in a previous retrieval attempt by the French. During the course of this search, they had happened upon some large pieces of wreckage. Although their sighting was several hundred meters south of southern boundary of the debris field, he felt that he could find his way back to it. I related my theory to him and from his description of the wreckage he had seen in 2000, I felt confident that this could lead to the proof that I was looking for. The problem I faced was convincing both the MIR pilot and whoever would be accompanying me in the MIR to forego much of their bottom time at the popular wreck site to venture off on what might turn out to be a wild goose chase. Although I did much lobbying over the next several months by both fax and e-mail, I was uncertain if I was going to be able to pull it off. Once the Russian research vessel Keldysh was at sea, I spoke of my quest to Capt. Fred McLaren a retired nuclear submarine commander with whom I had established a friendship during a previous expedition to the Hydrothermal Vents. After listening to my theory, Fred volunteered that he would be my dive partner on this search as he, like I, had previously visited the Titanic. The plan was to descend down by the bow section and then move on to the stern and utilize it as a demarcation point for my search. Armed with notes provided by Concannon and a copy of his August 6, 2000 dive profile which I was able to secure from files inboard the Russian research vessel Keldysh, Anatoly, Fred, and I headed to the bottom on the morning of July 7, 2003. We touched down some distance west of the bow and once the lights were turned on and I was able to see out of my porthole, I knew we were in trouble. The sea snow was a virtual blizzard, worse than I had ever seen it. It was close to white out conditions with visibility only a few meters. “Sea Snow” as it has come to be called, is composed of plankton and the remains of tiny sea creatures raining down from the water column above. It has been speculated that the over fishing of the Grand Banks has exaggerated the amounts of “Snow” simply because of the elimination of the animals that feed on this beginning of the food chain. After all three of us agreed that the snow was worse than any of us had ever seen at the site before, Anatoly flipped the switch on the powerful 330 kHz forward seeking sonar to enable our continued navigation to the bow. Didn’t work! All we had was a blank screen. Now I really knew that my mission was in serious, serious jeopardy. After utilizing a of bit of dead reckoning navigation to the bow section, I was surprised to see the amount of deterioration that has taken place in the short time since I last visited in 2001. Although I had previously heard rumors that damage might have occurred at the site from unauthorized use of unmanned ROVs by unnamed visitors the previous fall, my observation of the forward mast provided me with no indications that its splitting and further breakup has been due in any way to abortive salvage attempts. It would appear that the wrapped steel sheet it was formed from has simply relaxed as the rivets have failed from the accelerated corrosion that has taken place. After spending what seemed no more than 30 minutes at the bow section, we headed off towards the stern, again being forced to use dead reckoning and the sub chart plotter to find our way. Along with the reduced visibility and our non-functional sonar, we also experienced an unusually brisk south to north current. Although Anatoly judged the current to be in the area of one knot, I would estimate that it could have been easily twice that as the MIR 1 had to really labor to make headway towards our ultimate destination. The reduced visibility and the absence of a functioning forward seeking sonar necessitated traveling over the bottom plain at an elevated level as a safety precaution against the possibility of collision with projecting wreckage. This mode further reduced the opportunity for visual recognition, particularly through the small observation ports of the MIR. Once we were able to make our way to and positively identify the stern section, we struck out on a southerly course in an attempt to rendezvous with the coordinates that I had determined from Concannon’s information. Maintaining a steady course was difficult due to the strong current. Traveling south from the stern section we encountered much china and other porcelain artifacts material along with some small sections of metal superstructure debris. No large metal sections such as those described by Concannon were observed. In the course of traveling south from the stern section at a level approximately 50-75 meters off the bottom, a strange looking creature suddenly appeared swimming vertically, passing close by my view port as it appeared on my lower left and exited from view to the upper right. I had my camera running and neither Anatoly or Fred were able to witness this creature’s passing. It appeared to be barrel shaped, perhaps 25-30 centimeters in vertical length and 10 centimeters in girth. It was propelled by a single, bat-like semicircular wing and moved with what appeared to be a high degree of agility. About 10 minutes later, I encountered another one of these creatures swimming in virtually the same manner as the first, only this animal exhibited a high degree of bioluminescence. I didn’t realize until the expedition was completed and I was reviewing my film that I had caught both of these creatures with my video camera. 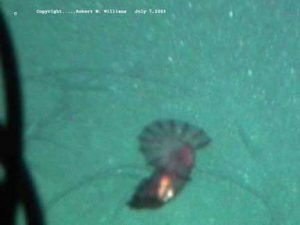 At first, I thought that I might have tripped upon a new species of deep sea animal but after consulting with Dr. Bruce H. Robison of the Monterey Aquarium Research Institute, learned that I had seen a deep sea species of bioluminescent sea cucumber known as Enypniastes Eximia. This odd form of holothurian is one of about 25 species that has adapted from the sedate sea cucumbers found on the bottoms of most oceans at all depths to one that remains on the bottom only to feed and then swims up in the water column to avoid predators. Its bioluminescence it thought to be employed as a defense means, rubbing off on its attacker and thus exposing the predator to potential attack by larger predators prowling the lightless depths. After venturing some 800 to 900 meters south without seeing what I was looking for, we turned to travel out of the debris field and then north with the current. At approximately 16: 30, as we sped across a point that would estimate was almost due east of the coordinates I had plotted, I did see what appeared to be two sections of hull plating standing vertical from the bottom in an area virtually devoid of breakup debris at a depth of about 3840 meters. These crumpled pieces were standing on edge, burrowed unto the bottom mud much in the same manner as the Titanic’s bow. Unfortunately, I was unable to get a photo of this fleeting glimpse* due to our accelerated bottom speed facilitated by the northerly flowing current. I immediately informed Anatoly as to what I had seen and requested that we come about immediately and take a reverse azimuth to return to this site. As we started our turn, a very large Dumbo octopus swimming a few meters ahead literally swam into the main view port. To sate everyone’s interest in this unusual creature, we spent a few minutes drifting with the current photographing this animal, who seemed totally unruffled by our abrupt meeting. By this exercise, we compromised our established track and when we resumed our turn, we weren’t able to find our way back to the previously mentioned hull plating section. Although we spent over an hour in our search, the absence of the forward sonar made our return to the site of this promising debris a virtual impossibility. After completing the dive and reviewing the dive profile generated from the transponder data of our submersible’s course during that dive, I would estimate that we came within 150 meters of the plates I had seen but conditions existing on the ocean bottom, complicated by non functional navigational systems serve to prevent us from reachingthat destination. Needless to say, I came away from this experience with a deep sense of disappointment having come so close to my objective but not being able to completely achieve it. I had hoped to develop concrete photographic evidence which would serve to overturn the currently accepted theory that the Titanic was sunk as a result of damage incurred by a sideswipe of her starboard hull rather than the more logical conclusion of grounding on the berg’s underwater ice shelf. Luck was not in my corner on July 7, 2003 however I did come away with a visual observation that would have provided the proof that I was looking for. Whether I would ever be afforded a future opportunity to again visit Titanic, I could not say at that point in time, but I continued to hold out that hope that I would. I knew that there would be no more expeditions to Titanic in 2003 as well as 2004. 2004 was the year for the scheduled disassembly and 10 year retest for both MIRs, and so it was not likely that the opportunity for another visit would be anytime soon or ever, for that matter. However, once the MIRS are back in service , I knew that I would again be standing in line… but this time much closer to my quest. The two year wait for the next opportunity to visit Titanic provided me with time to evaluate my three deep ocean dive experiences as well as do further research. Although I remained convinced that the Titanic grounded, a nagging question remained. 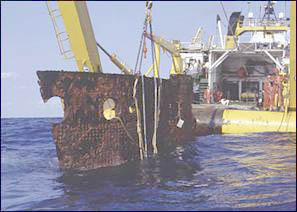 In grounding situations, a hull break up usually follows in the sinking process. The Titanic did, in fact, break up in its final moments before plunging to the bottom. However, the collision damage of the Titanic occurred on the forward third of its hull but the break up occurred on the aft third of the ship. Why did this great ship break in a location that seemingly was free of collision damage? I became convinced that something had occurred during the accident that heretofore had not been reported. This realization and further research changed my plan for my future revisit to the Titanic site, if such a rendezvous were to ever be possible. I still needed to photograph the plates I had seen in 2003, but I also needed to document another more important event that I was now sure held the key to the disaster. Knowing that the ship broke up in an area of its hull that seemingly escaped damage during its brief but fatal encounter with the iceberg, it was easy to speculate that that single event was the one responsible for the appalling loss of life. Had the Titanic not broke up, it is likely that it would have remained afloat long enough to allow ships steaming to its rescue to reach the site before the cold North Atlantic waters claimed those unfortunate enough to not be afforded space in the lifeboats. My research into the ship’s construction led me to some important conclusions. There has been much speculation as to the quality of the steel plating and rivets used in the Titanic’s construction. “Inferior” is a word often used in scientific reports and some have even gone so far as to lay the majority of the blame for the disaster on such “defects.” Although the steels used at the turn of the century could be termed inferior to those produced today, the idea that Titanic was lost due to alleged defects in these elements of her construction is rubbish! Her elder sister ship and almost identical twin, the Olympic, sailed well into the 1930’s and ended up being recycled in a scrap yard after a career dotted with mishaps that would have surely revealed such construction defects. Amazingly, the Titanic’s problems were the result of her newness at the time on the accident. Having been launched less than a year before her hurried sea trial and departure on her one and only voyage, the Titanic had spent the majority of her brief life floating in the brackish waters of the builder’s quay. As was the practice for building steel ships in the early twentieth century, Titanic’s hull was constructed of overlapping steel plates held together by iron rivets. A little known fact is that ships of this type of construction are weakest when they are first launched and actually become stronger as they age. This phenomenon is due to the fact that the shear strength of the rivets holding her plates tightly against one another at each of the lapped joints is the primary basis of hull integrity of a new ship employing this type of construction. New steel plates have clean smooth surfaces and remain that way until sea water has the opportunity penetrate the tightly lapped areas held together by rivets. This water penetration is facilitated by a process known as “capillary attraction” and is aided by the normal flexing of the hull over a period of service in a seaway. Until this penetration and resultant surface corrosion is allowed to occur, the coefficient of friction between the mated surfaces of overlapping plates is relatively low. However, once these surfaces become slightly corroded, the coefficient friction is vastly increased and thus inhibits the possibility of plate movement when subjected to lateral stress. Within the axiom of this phenomenon, lies the basic cause of the Titanic disaster. 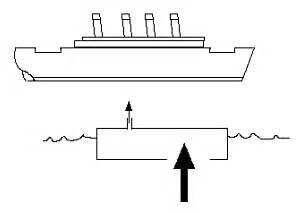 The Titanic was constructed with two “Expansion Joints” in its superstructure, one occurring just behind the first funnel and the other further aft between the third and forth funnels. The purpose for these joints as well as their locations were both logical and simple. The ship’s designers realized that a ship’s hull, particularly one as long and narrow abeam as Titanic, would naturally flex in a seaway, particularly when pushing through heavier seas. The logical location of the first joint would be just aft of the bow, the portion of the ship which would first encounter the forces of the sea. 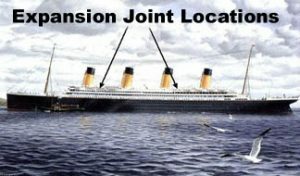 The location of the second joint was subjective and was placed at a location that would be more subject to flexural stress due to the ship’s construction . The second joint was placed in the area of the ship directly above its machinery space. Whereas the Titanic had eleven decks that ran from stem to stern, many of these decks were necessarily interrupted to allow for the two towering triple expansion steam engines that drove its two outer propellers. 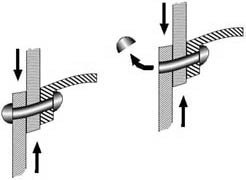 To allow for this hull movement on the attached superstructure, expansion joints were provided to allow for this transmitted movement, thus preventing damage to the superstructure. Of course, in no case did the designers of the Titanic anticipate the hull movement that might occur in a grounding at almost full speed. With the preceding knowledge , I thought back through the chain of events that commenced during the late evening hours of April 14 , 1912. First, the grounding occurred as First Officer Murdock successful avoided crashing into the above water portion of the iceberg only to strike the Titanic’s relatively flat bottom on the hidden ice shelf that sloped away underwater from the base of the exposed berg. As the Titanic’s massive hull rode up on the shelf tearing away bottom plating, its weight caused the shelf to be pushed down, levering the above water portion of the iceberg towards its passing starboard bow, brushing off loose chunks of ice unto its forward well deck. But something much more sinister was occurring during those few seconds of contact…… the ship’s hull was twisting to port as its flat bottom rode up on the underwater shelf’s transverse incline. At the first contact, the ship’s bow made a quick flex to port causing the superstructure in the area of the forward expansion joint to move with it. The airfoil effect and stabilizing inertia acting on the leading funnel, held in place by a series of support cables anchored to the superstructure both fore and aft of the expansion joint, caused it not to move in complete relationship with the hull and superstructure twist. This served to compromise the cable fastenings on the port side of the funnel…. an event that became apparent a few hours later when that funnel tipped forward and fell to starboard as the ship was level abeam sinking by the bow. But the real death blow was starting to happen further back, in the area of the second expansion joint. When the hull twist occurred in this area adjacent to the machinery space, hull plates started to move against one another. The corrosive forces previously mentioned had not sufficient time to dampen or prevent this movement and plates located on the sides of the hull in this location started to move. Their movement created an action much like a set of bolt cutters on the rivets holding those plates together. Many rivets were snapped in the process and most being above the water line did not signal their compromise with an immediate ingress of seawater. No doubt these breaking rivets emitted considerable noise but it was masked by 55,000hp and the clanking of connected machinery running at close to full speed. The fact that the occupants of this area of the ship….the engineering staff….were not among the survivors, left no one to testify on this event. The answer was now apparent as to why the Titanic broke up at a location far aft of the iceberg contact damage. Unlike wooden sailing ships that had come before, the Titanic did not possess a keel as had been previously known and described. Instead of having a single main timber at the lowest point of its hull as a foundation onto which all the other members of its hull skeleton were attached, the sheer size of this vessel demanded other considerations. As long as three football fields, this ship was treading new ground in the facets of marine engineering. The ship’s “keel” was basically a flat sandwich of steel plates composed of its outer bottom and the “tank top” of its double bottom, separated by a series of longitudinal and transverse girders….. an assembly which in of itself, possessed minimal longitudinal strength. If there had been a way to lift this “keel” from any single point during that early phase of the ship’s construction, it would have surely crumpled under its own weight. 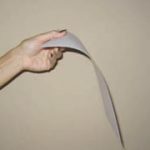 This consequence can be easily demonstrated by lifting a single unfolded sheet of paper from one end. However, once the vertical sides of the hull were attached to this “keel,” longitudinal strength was achieved by virtue of the “U” beam effect provided. 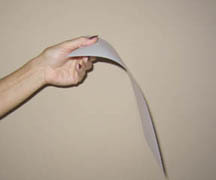 The middle photograph demonstrates the longitudinal strength imparted to a sheet of paper folded in this shape. And that strength would remain….but only as long as vertical sides of the hull remained uncompromised. The afore mentioned twist that occurred as the Titanic rode over the underwater shelf laid waste to that hope. Referencing the previous demonstration with a folded sheet of paper ……. 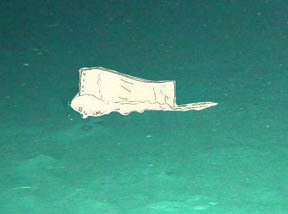 Now cut the vertical sections of the folded piece of paper, mimicking what happened to the Titanic’s hull sides when the stresses of sinking by the bow compromised those remaining rivets in the area of the second expansion joint…… those that were not sheared as it twisted over the submerged ice shelf. The bottom photo aptly illustrates the loss of longitudinal integrity of the ship’s hull which resulted in the early break up which occurred at 2:18 AM on April 15, 1912. While there has been much speculation over the years following the disaster, there was an instance that occurred in late1916 that should have guided experts to the correct answers concerning Titanic’s break up and sinking. In November 1916, Titanic’s sister, the Britannic provided an example which should have put to rest the idea that the Titanic was lost due a brush on its starboard bow by an iceberg. Ironically, the Britannic was sailing along in a smooth sea and encountered a German mine. 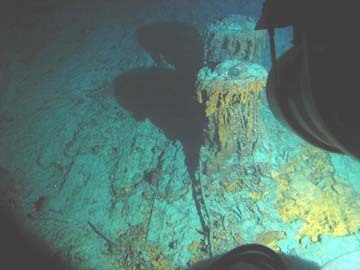 As fate would have it, the contact with this mine was in the same area on its starboard bow as so-called experts would have us believe that Titanic encountered a submerged ice spur which resulted in a 300 foot gash or parting of a riveted seam just under its waterline along its starboard side. The mine blew a hole in the Britannic’s starboard bow and although this hole was not 300 feet long, it was large enough to compromise the integrity of the surrounding watertight compartments and the force of the explosion prevented some of the compartment doors from fully closing, resulting in a situation similar to Titanic’s hull breach less than 5 years before. Like Titanic, Britannic quickly began to sink by the bow. However, unlike Titanic, the Britannic also began to list heavily to starboard….after all, that was where the hole in its hull was located. The Britannic continued to sink by the bow and like Titanic, this action caused Britannic’s stern to lift free of the ocean’s surface, exposing all three of its propellers. Survivor reports tell of the stern lifting high in the air and then sliding away under the surface with hardly a ripple. Sound like a familiar story? You bet! But something is dramatically different….the Britannic did not break up! The reasons that it didn’t are simple. Although the Britannic suffered its injury in virtually the same spot as experts claim occurred on the hull of Titanic, the documented results were markedly different with both vessels. The Britannic suffered a breach in its starboard bow just below the waterline in the same area that many students of the Titanic disaster have claimed as the fateful location of Titanic’s fatal injury. If this claim had been correct, the events of Britannic sinking in 1916 would have produced important collaborating evidence to support that belief. Instead, the sinking of the Titanic’s sister ship clearly contradicted virtually all of the established expert theories that had been developed relative to the physical causes of the Titanic sinking. And even more surprising, with this rock solid evidence to the contrary, there are still those possessing intelligent minds who continue to hold the belief that Titanic foundered as a direct result of sustaining a hole in her starboard bow. If the Titanic also sunk as the direct result of a hole or crack in its starboard bow which allowed thousands of tons of seawater to enter through that side, why didn’t it immediately assume the dramatic starboard list exhibited and maintained by the Britannic until it sank? The Titanic didn’t maintain a starboard list for the simple reason that the damaging hole allowing seawater to enter was located in its bottom and not in its starboard side. Although the hulls of both the Titanic and Britannic were holed in their forward sections, resulting both to sink by the bow, lifting their respective sterns clear of the water,…..only the Titanic broke up in the process. Why? Titanic: As described in this article, the Titanic grounded at speed on a transversely inclined ice shelf and the resulting torsional effect exerted on its hull resulted in the compromise of its riveted hull construction, effectively “breaking its back” (Keel, a.k.a its double bottom). Olympic: The twin sister of the Titanic was launched a year earlier and ended up in a scrap yard in 1934. It the years between, the Olympic collided with a British warship, rammed a German U-Boat sinking it, and ran down the Nantucket Lightship sinking it with nary a rivet pop. Early in 2005, I made preparations to participate in the 2005 expedition to the Titanic, hoping to find evidence to support my expanded theory. The plates I had seen to 2003 were still there and I now knew their location from comparing the time line contained in my dive profile data sheet and the digital time log on the video cameras taken with me on that dive. 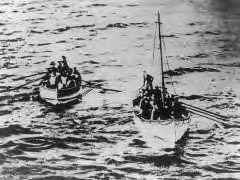 However, in the period since that dive, more and more who had made the Titanic disaster a study were also beginning to accept the possibility of grounding. The realization that creating the same dive scenario which had enabled me to venture away from the main wreck site would be difficult to duplicate on the upcoming dive caused me to realign my priorities. My emerging belief that the hull twist had been the major contributor to the disaster made me realize that it might be more practical for me to secure proof in that regard rather than trying to structure a dive to merely photograph the hull plates I had seen previously…… after all, I knew where those plates were and knew that they would not be going anywhere any time soon. What I needed as evidence of hull twist was feature that could only occur when such an action took place. There are a lot of broken pieces of hull and sheared rivets littering the Titanic debris field but none of these in and by themselves could offer the evidence I needed…. Or could they? When the Titanic broke up shortly after 2 a.m. on the morning of April 15, 1912, plates moved and rivets sheared as would have been the case when the hull twist occurred at 11:40 p.m. the previous evening…. But with one important difference. When the Titanic broke up, the movement of plates and consequential shearing of rivets would have occurred in a “lateral” fashion. Rivet holes in plates would have been elongated in the process, and those elongations would have been horizontal as a consequence. On the other hand, the elongation of rivet holes that would have occurred in the vertical sides of the ship’s hull as the hull twisted during the collision would necessarily had to have been vertical in nature. Having made this determination, I was now left to figure how I might be able to correctly orient any piece that I found at the wreck site that might contain evidence of rivet hole elongations. I was sure that they existed but I also knew that the piece I needed to find would necessarily have to come from the vertical portion of Titanic’s hull in the break up area of the ship . Even if I was able to find a hull plate exhibiting elongated rivet holes, the more difficult challenge would be establishing the correct and unmistakable orientation of that piece when it was still part of the ship. Without being able to determine the direction of the rivet hole elongations, I would be back to ground zero. But luck was on my side this time. In 2003, a young fellow who had previously been a member of the RMS Titanic (RMST) artifact restoration team happened to trip upon my website. RMST is the Salvor in Possession of the Titanic wreck. Tarn Stephanos‘ lifelong dream is to dive to the site and he has been like a sponge absorbing all of the information I provide to him. He has been preparing for the day he too will board a MIR submersible and by living vicariously through my experiences as well as others he has come to know who also have also had the good fortune of visiting the wreck.. Perhaps thinking that he needed to reciprocate somehow for my time, he began sending me photographs that he had taken of artifacts retrieved from the wreck site during the time he was associated with the task of preserving them. Of particular interest were photos he had taken of the “Big Piece,” a large section of the Titanic’s starboard side hull retrieved from the ocean bottom by RMST in 1998. The “Big Piece” originated from the area of the aft expansion joint and likely had been subjected to both the twist of the hull as the Titanic’s bow rode over the sloping ice shelf and also the stresses of the ultimate break up. Most importantly, this was a piece that could be clearly oriented as to whatwas up, down, sideways, etc. because it has portions of the ship’s vertical ribbing still attached to it. If those orienting features were not enough, it also contains a couple of cabin portholes. This was a piece that likely had horizontal rivet hole elongation because of its proximity to the break up that occurred in Titanic’s final moments but, if I was correct, might also exhibit the vertical elongations that would substantiate the hull twist. After closely examining the photos supplied, it became apparent that this piece of wreckage possessed the tangible evidence that I had been seeking. Vertical elongations were clearly visible! Having now secured the proof demonstrating that the hull twist did in fact occur, another important mystery had finally been solved! Realizing that securing this evidence was the primary reason for joining the 2005 Titanic expedition, I made the decision to instead make the deeper dive to the German Battleship Bismarck in 2005. That adventure is described on another page on this site. But I still wanted to make at least one more dive to the Titanic! I was scheduled to participate as both a diver and lecturer in the 2006 Titanic Expedition organized by Deep Ocean Expeditions but at the last minute the expedition was scrubbed due to the by the Russian government to recall the MIR’s and their mothership, the research vessel Keldysh, back to the Baltic Sea to undertake emergency undersea pipeline repairs. It is my fervent hope that the years ahead will again offer the opportunity for me to secure additional evidence of what really occurred on that fateful evening in April 1912. Coinsiding with the recent 96th anniversary of the sinking, yet another book has been released claiming to have finally solved the mystery of the disaster….. inferior rivets. As I have previously stated, although the metallurgy of all the Olympic class ships of the era can be called into question against the backdrop of present day technology, there still remains ample evidence that construction quality issues were not the primary contributing cause of the Titanic disaster. The authors of this latest work provide opinion as to why those who have offered theory before must be discounted but interestingly fail to make any comment as to theory I have just presented to you. Their research in writing their book either did not take them to this website or, more likely, their scope of marine knowledge and single minded focus did not allow them to consider what happens when a long, thin flat surface encounters and partially slides over a transversely inclined surface. Although this new work contains a wealth of information, it is truly unfortunate that its conclusion leads the reader in the wrong direction.